Seaweed and sea vegetables are some of the healthiest foods on the planet, and truly define “nutrient-dense.” Before getting into why, let’s look at what this term means, exactly. The definition of density is as follows: the degree of compactness of a substance. And the same rule applies when talking about nutrient dense foods, which is a term that is increasingly used in the world of health and nutrition. So, what are we really talking about when we refer to nutrient dense foods? First, let’s break down the meaning of the term, and then we’ll get into which foods are most nutrient dense. Referring to a food as nutrient dense is a simple way to relate the nutrient content to the calorie content. 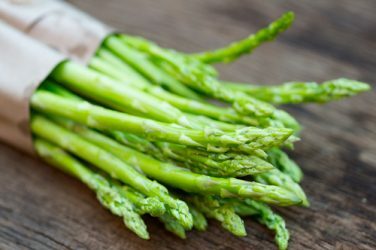 How much benefit are you receiving from any given food, versus the “cost” in calories? If a food is truly nutrient dense, it provides a high nutrient content in relation to how many calories it contains. 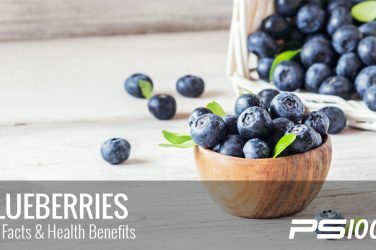 In other words, it provides a big “bang for your buck,” in the sense that you will eat fewer calories, and take in more nutrients. Seaweed tops the list of nutrient dense foods, offering a plethora of trace minerals that cannot be found in any other foods. The nutrient iodine is often deficient in modern, western diets, and is critical for healthy thyroid function. Seaweed is also high in fiber, and even contains a complete protein (1). Various types of seaweed have been long used for their culinary and nutritional value in Asian cuisines, but are becoming increasingly popular in the United States. Seaweed comes in many forms of algae, micro-algae and marine plants that come in red, green, brown and even blue colors. Nori is usually sold in dried sheets and is what you get when you eat sushi rolls. Kelp usually comes in big, brown sheets that is cut into strips and added to dishes like soups. You can also replace kelp for noodles, and many health food stores carry pre-prepared “kelp noodles,” that you simply eat in boiling water and use a replacement for noodles or pasta. Kombu is a type of kelp that has a very strong flavor and is often used in soup stocks. Arame is also a type of kelp that has a much more mild taste and can be used in a wider variety of ways. Dulce is an algae that comes in a red color and has a lighter, sweeter taste. You can find this often in the form of dulce flakes that can sprinkled over salads, veggie or meat dishes, or it can be enjoyed as a dried snack. 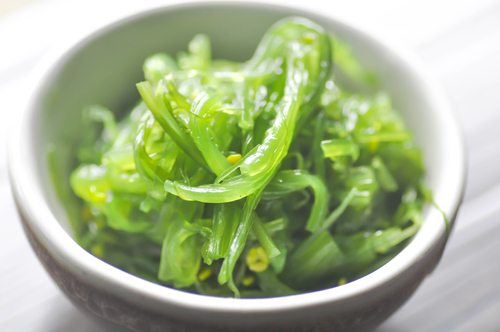 Wakame is what you’ll often find in a seaweed salad, as it has a mild flavor and is quite versatile. You can use it in a variety of dishes. Chlorella and spiralling are both micro-algaes that have become very popular n the nutrition community (for good reason) and come in powder form. They are most often used as a booster-food, added to smoothies or even taken as supplements. Seaweed is high in the mineral iodine, and iodine is essential for healthy thyroid function. Our thyroid gland is hugely important to health, as it works to regulate the body’s metabolism (3). Iodine deficiency can lead to hypothyroidism (slow functioning thyroid), which can cause serious symptoms of fatigue, weight gain, hair loss, lethargy and more (4). Some types of seaweed are higher in iodine than others, so it’s important to discuss with your healthcare practitioner if you suffer from a thyroid condition, to make sure you aren’t getting too much or too little iodine. For example, spirulina is fairly low in iodine, and kelp is quite high. Mainly due to its impressively high nutrient content, seaweed can support healthy cardiovascular function. For example, seaweed is high in soluble fiber and contains omega 3 fatty acids, both important for heart health (5). Also, studies have shown that including seaweed in the diet can help to reduce blood pressure in hypertensive individuals (6). Not just because seaweed is low in calories, but studies have actually shown that compounds in seaweed might affect leptin levels in the body (the hunger hormone), which (especially when combined with seaweed’s high fiber content) helps to control hunger and decrease cravings (7). 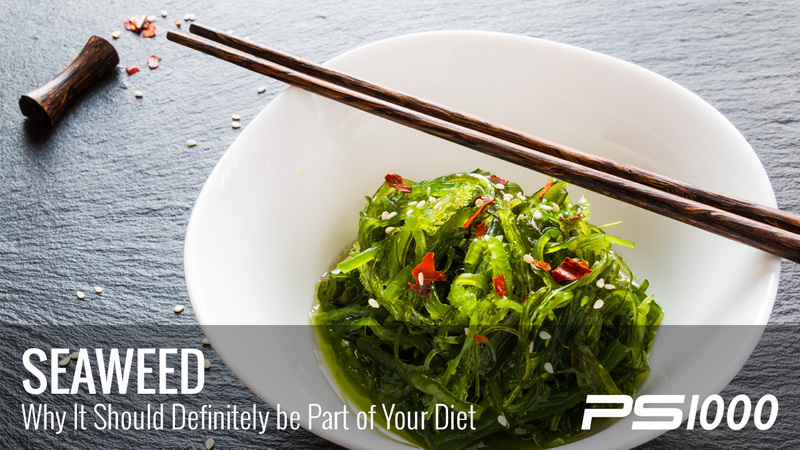 Research has shown that compounds in seaweed can also help to balance blood sugar levels (8). Also, the fiber in seaweed has an affect on the rate of carbohydrate absorption, which is directly connected to healthy blood sugar levels. This means that seaweed can help prevent and control diabetes, as well as help to control carbohydrate and sugar cravings throughout the day (9). Convinced yet? Now you are probably asking yourself “how on earth do I eat seaweed?” And the good news is, it’s actually pretty easy. Try a few of these simple ideas. 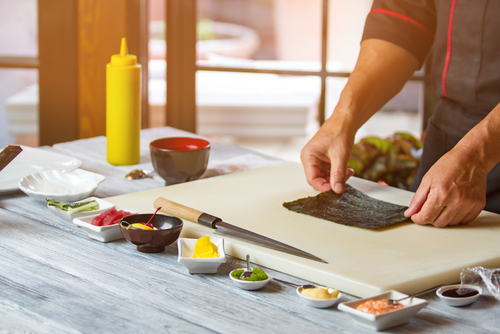 First, you could make your own sushi (not as easy) or use nori sheets to make a wrap instead of a tortilla. Wakame or dulse can be added to any salad, or try this delicious seaweed salad recipe. At any local health food store you can find dried sushi snacks (just be sure to skip the ones with added sugar), or you can add chlorella or spirulina to your morning smoothie. You might just find it provides a better boost than coffee!